When it comes to small family gatherings, I’m always asked to bring dessert with me. So what I usually do is head over to Foodgawker or Pinterest and look up some inspirational images or go through my list of “recipes I want to try”. 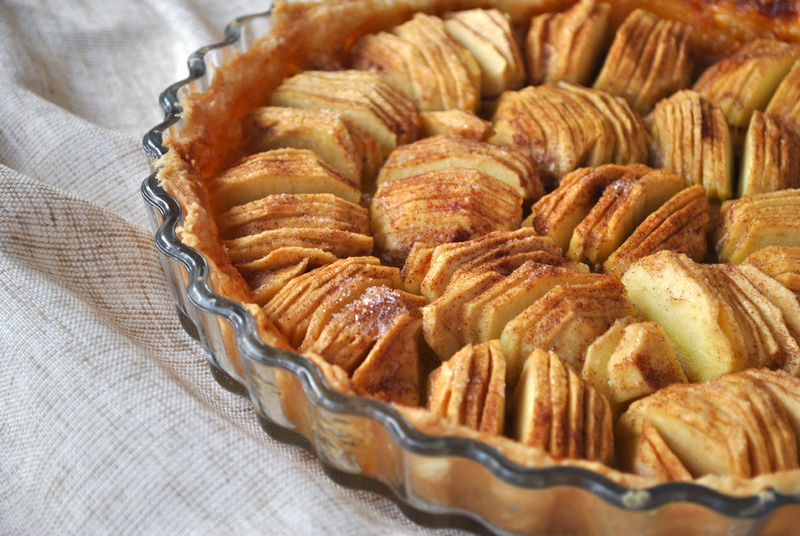 The Apple Tart is definitely on my “to-try” list. I’ve had my eye on this recipe for months! First, start making the dough which is essentially pate brisée (French for shortcrust pastry – It doesn’t rise when baked and it has a buttery flaky texture). 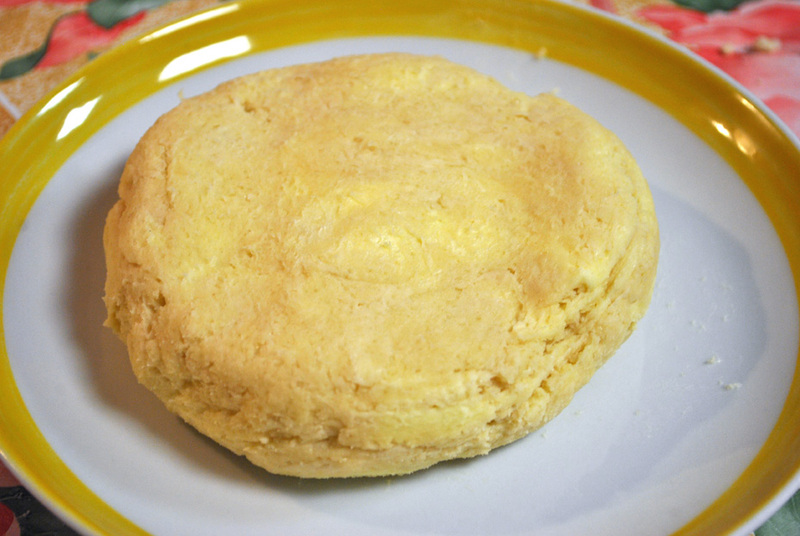 It is made from equal parts of cold butter and flour blended into pea sized bits, then held together with a small amount of ice cold water to form a crumbly dough. Transfer the mixture onto a working surface, then shape into a disc and place it in the fridge for an hour at least or overnight. Next, peel, core (I used a melon baller), halve apples, and thinly slice them while keeping them together to retain the halved apple shapes. Then take out your dough, roll it out on a heavily floured surface to avoid sticking to the work surface. I rolled it out on a baking paper because it made the process of transferring the dough to the tart pan much easier. If you don’t have a tart pan, you can fold in the sides of the dough galette style, and bake on a baking sheet. Next, brush the dough with apricot preserve and place the sliced apples on the dough in concentric circles. 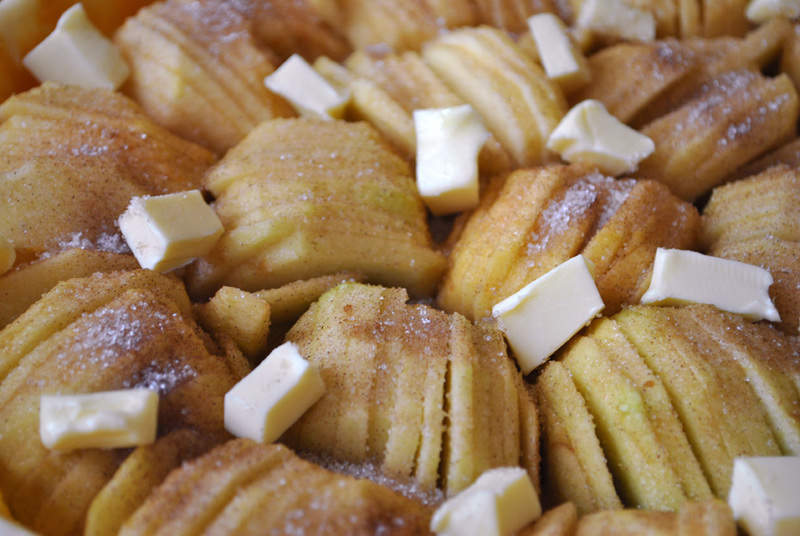 Finish off by sprinkling sugar, cinnamon, and few cubes of butter. 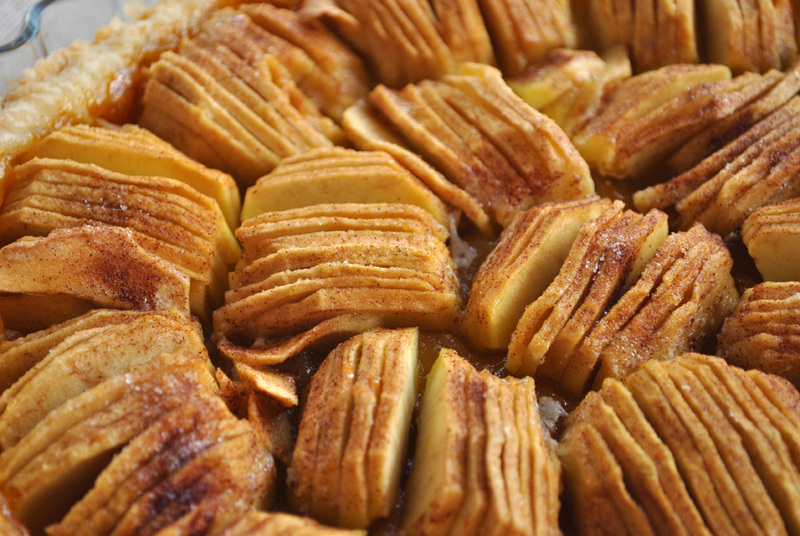 Bake until deep golden brown in color and serve warm with ice cream or whipped cream! 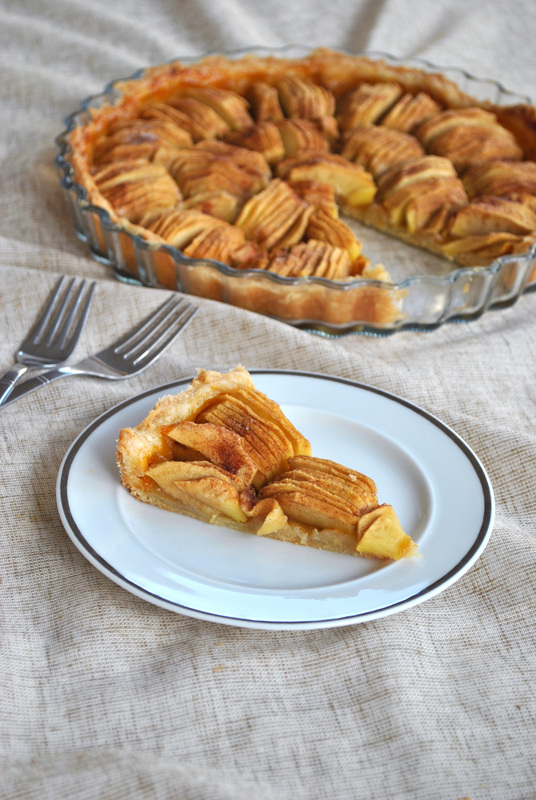 Here it goes: A simple flaky thin crusted apple tart filled with buttery soft apples. 1. 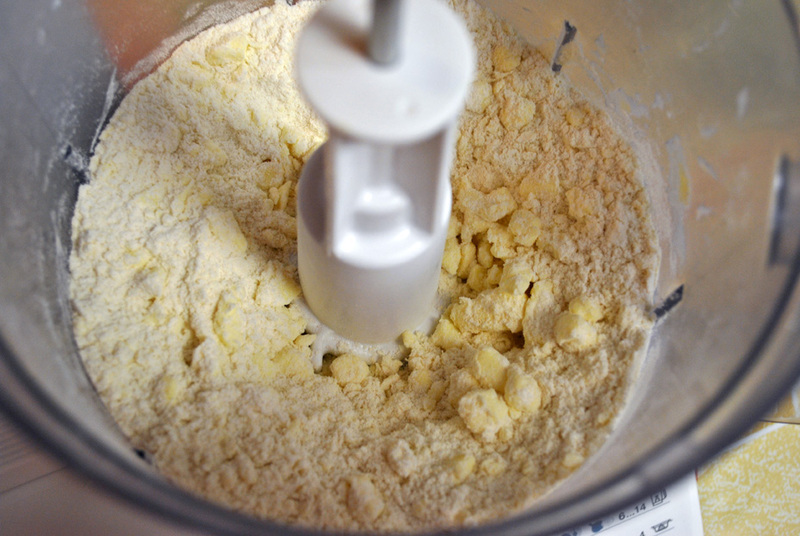 Add flour, sugar, butter, and salt in a food processor. 2. 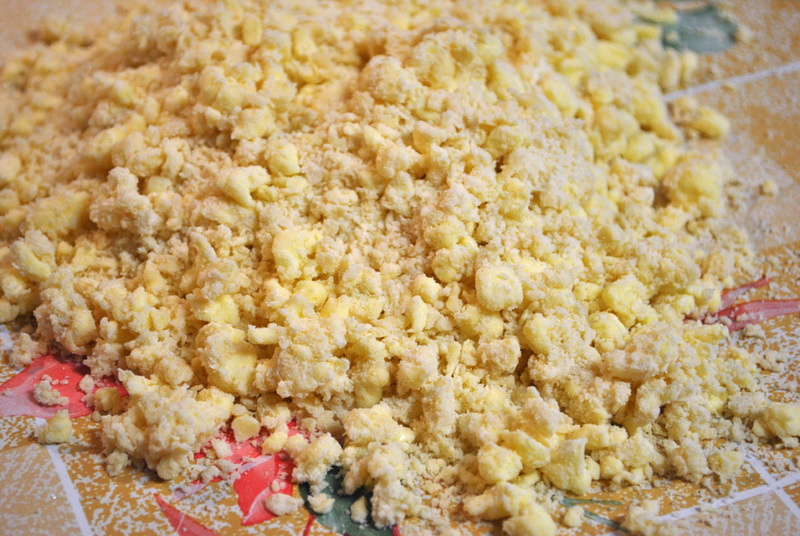 Pulse 10 times until pea­-size crumbles form- meaning, turn the food processor on and off in short cycles. 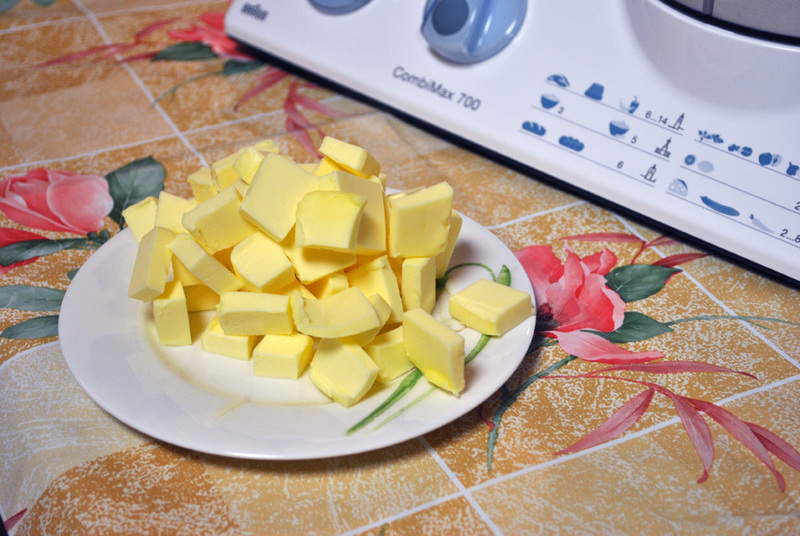 It’s very important to use cubes of COLD butter, to avoid melting it into the dough. Do NOT break down the butter too much, you won’t get a flaky dough if the tiny bits of butter are not visible. 4. 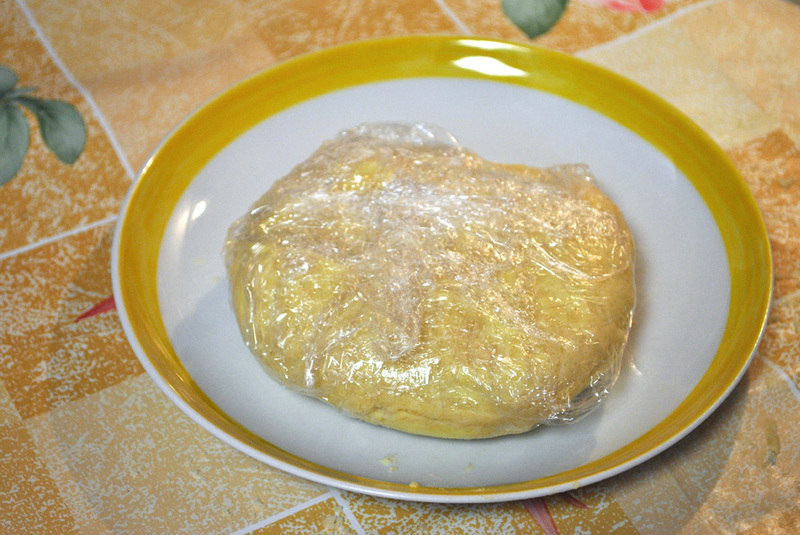 Transfer dough to a work surface and form into a flat disk using your hands; Plastic wrap the dough and refrigerate for at least an hour or up to 2 days. 5. Peel, core, halve, and thinly slice apples — keeping the slices together. 6. Unwrap dough and transfer to a generously floured work surface. Press down the dough with a rolling pin and move it from the center out. Roll into a 25 cm (10 inch) thin circle and then transfer to a 22 cm (9 inch) tart pan, and trim edges. Work quickly to keep the dough cold and to avoid stickiness. If the dough softens, chill it in the freezer for a few minutes. 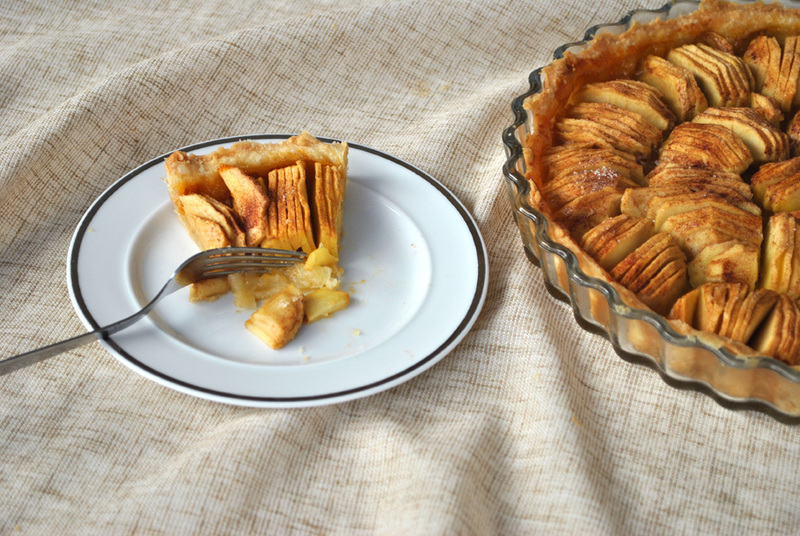 — I used a glass tart pan, you can also use a non-stick tart pan with a removable bottom. The dough rolls out up to 30 cm or 12 inch. 7. 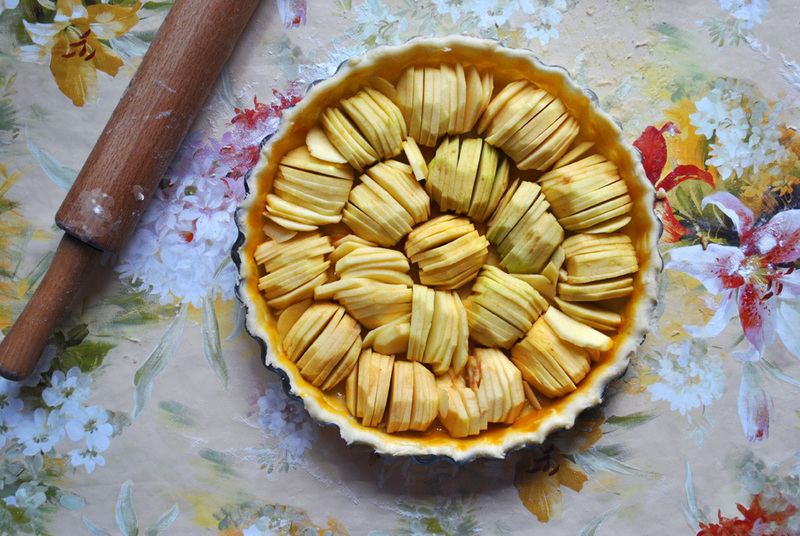 Brush apricot preserve onto the bottom of the pastry. 8. Heat oven to 190ºC or 375ºF. 9. 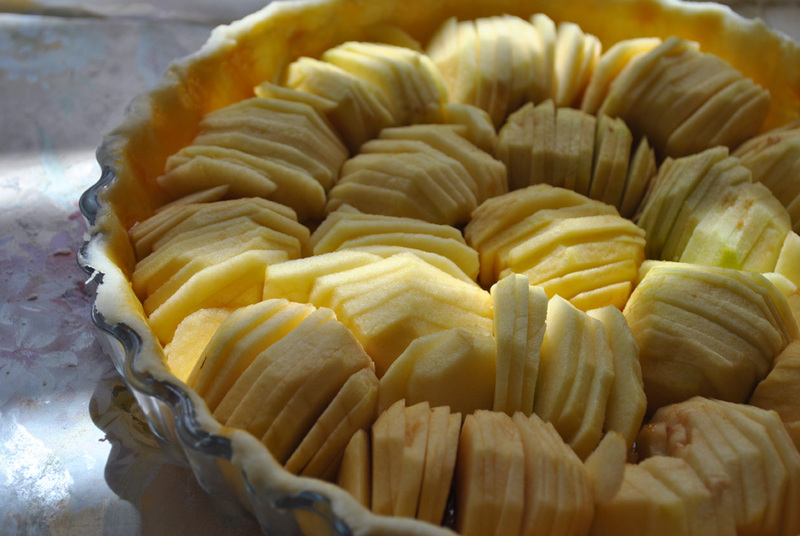 Transfer halved sliced apples to the tart pan and press gently as you are placing them next to each other. Start out at the outer edge of the pan working your way to the center. 11. 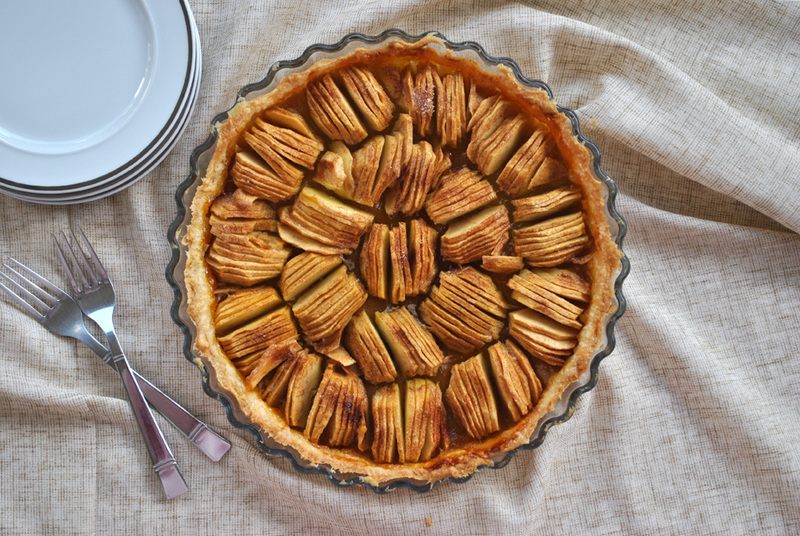 Sprinkle the tart with the sugar-cinnamon mixture, and add small cubes of butter (Use as much or as little as you like).